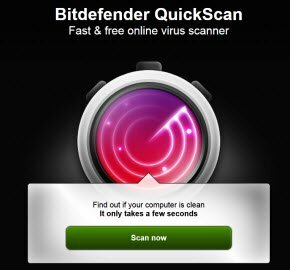 Bitdefender has released a faster, smoother version of its free online malware scanner, that allows computer users to scan their computers for malware, in less than a minute. QuickScan has been accessed by 2.9 million users in 2011 and turned up almost half a million infections. The security of users is our paramount concern, and we are proud that QuickScan is one of the fastest and most effective way to check whether your computer is infected. Just ask the millions of people who used it last year,” said Razvan Costache, QuickScan’s product marketing manager. “We’re confident that these changes will make QuickScan an even more popular tool in the fight against malware and other online threats. To scan you computer, head over to QuickScan website and click on the Scan Now button. You will be prompted to istall an ActiveX plugin. Please go ahead and do so. 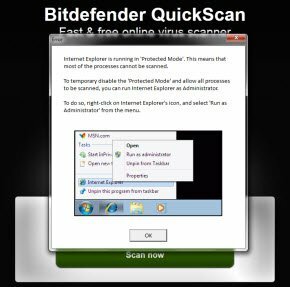 Once installed, it takes just one click and 60 seconds for BitDefender QuickScan to check users’ PCs for free, allowing you to make an informed decision on whether they need help removing malware or installing further security protection. If you are running your Internet Explorer in Protected Mode, you may be required to restart it – this time as administrator. Please go ahead and do so. The scan will commence and will complete in less than a minute. While the scan is running, you will get to read some interesting snippets of security facts – enough to keep your mind occupied for that minute. You will finally be shown the results of your scan. In my case too the scan took less than a minute. 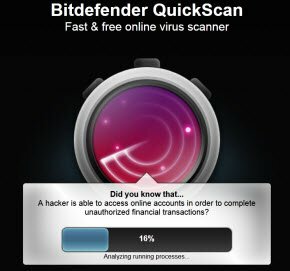 Yes, QuickScan is fast and reliable too – unlike its free BitDefender Security Scanner and Registry Cleaner, which some reported as being scareware! QuickScan is also available as a small add-on for the most popular internet browsers, including Internet Explorer, Firefox and Chrome. Its is always a good idea to take a ‘second opinion’ if at anytime you feel that your computer could be infected, but your existing antivirus software is not throwing up any warnings. You may also want to check out this list of Free Online Scanners or this list of Online malware scanners using multiple antivirus engines to scan your computer for Viruses. Very fast and – because of the server referencing – probably very few false positives or none at all. As a second opinion this is invaluable.